Calpains (EC 3.4.22.17, Clan CA, family C02) in mammals co-exist in cells with the very specific endogenous inhibitor protein, “calpastatin”, strongly suggesting the pivotal role of this inhibitor in the regulation of calpain activity (Goll et al. 1992; Kawasaki & Kawashima 1996; Maki et al. 1991; Menard & el-Amine 1996; Nixon et al. 1994). Calpastatin was first cloned in 1987 (Emori et al. 1987) and then found not to have exact secondary structures (Uemori et al. 1990). Calpastatin contains four equivalent inhibitory domains of ca. 140 residues having three conserved regions, A, B, and C, important for inhibition (Fig. 1). A and C interact with IV and VI, respectively, in a Ca2+-dependent manner, and B shows inhibitory activity by itself probably by binding at or near the active site (Tompa et al. 2002) (Fig. 2). Presence of two calmodulin-like domains IV and VI are necessary for effective inhibition by calpastatin. Thus calpastatin inhibits only dimeric calpain, namely μ-calpain, m-calpain, and nCL-4/CAPN9 with 30K. Calpain large subunit homologues including p94/CAPN3 and nCL-2/CAPN8 are not inhibited and escape from the regulation by calpastatin (Hata et al. 2001; Ono et al. 2004; Sorimachi et al. 1993b). Fig. 1. Schematic structure of human calpastatin Calpastatin has four repetitive inhibitory domains (1~4), which can inhibit one molecule of heterodimer calpains, although their inhibitory activities vary. At the N-terminus, there are two extended domains, XL and L, whose functions are unknown. Each inhibitory domain has three regions, A, B, and C, which binds to domain IV of catalytic subunit, the active site of domain II, and domain VI of regulatory subunit (see Fig. 2), respectively. Peptide corresponding to only the Region B has inhibitor activity, which is less than full-length domain. The Region B has highly conserved sequences at the center, whose consensus is GxxE/DxTIPPxYR. Fig. 2. Three-dimensional structure of 30K homodimer biding to calpastatin region C and synthetic calpain inhibitor molecule PD150606 A peptide corresponding to the Region B (see Fig. 1) of human calpastatin binds to the first α-helix (E-helix) of the first EF-hand motif (EF-1) of both 30K molecule. PD150606 (3-(4-iodophenyl)-2-mercapto-(Z)-2-propenoic acid), which is a unique synthetic inhibitor molecule for calpains not directing to the active site, binds close to the loop region of EF-3 and E-helix of EF-5. Cross-eye representation. Maki’s group, the successors of the late Prof. ex-Murachi, one of the great pioneers of calpain research, examined the interaction between calpastatin and calpain subunits in a real-time biomolecular interaction analysis using a BIAcore instrument (Takano et al. 1995). They showed that three subdomains of the reactive site of calpastatin bind to domain IV of the large subunit, the active site, and domain IV’ (VI) of the small subunit, respectively, a finding consistent with their previous observations (Crawford et al. 1993; Kawasaki et al. 1993; Ma et al. 1994; Nishimura & Goll 1991; Takano et al. 1995). Interestingly, the muscle-specific homologue of calpain, p94, described below, is not inhibited by calpastatin, and, moreover, proteolyzes it in the COS-cell expression system (Ono et al. 2004; Sorimachi et al. 1995). One possible explanation for this is as follows: Calpastatin binds to the Ca2+-binding domains of both the large and small subunits, but p94 is not associated with the conventional calpain small subunit as described below, and, thus, calpastatin cannot bind firmly to p94, resulting in the digestion of rather than inhibition by calpastatin. Fig. 3. Three-dimensional structure of μ-calpain protease domain (domain II) with Ca2+ and inhibitor molecules Ca2+ (dark blue ball) binds to the upper side of the active site cleft, which consists of Cys115, His 282, and Asn 296 (red ball-and-stick). E64 (upper) and leupeptin (lower) covalently bind to the sulfur atom of the active site Cys115. 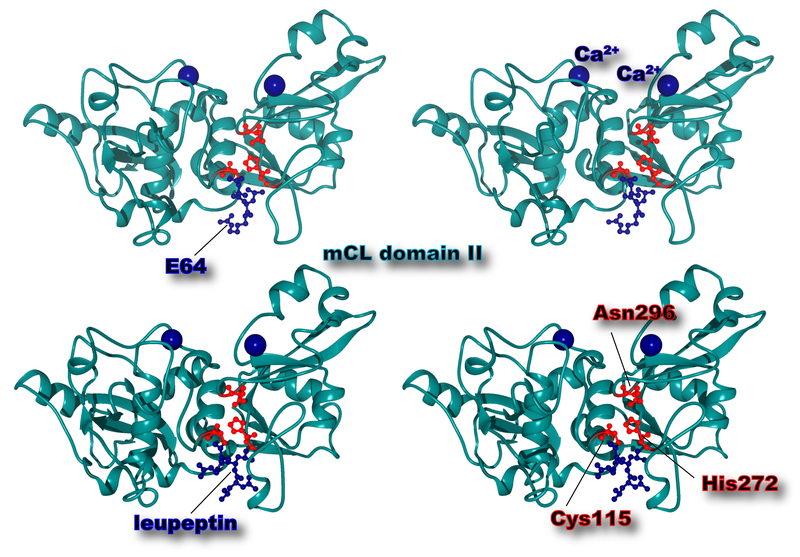 While E64 is an irreversible inhibitor, leupeptin dissociates from calpain when Ca2+ is depleted. Cross-eye representation. As for synthetic calpain inhibitors, their history goes back to 1980 when Sugita and colleagues used derivatives of E64 (N-(N-(L-3-trans-carboxyoxirane-2-carbonyl)-L-leucyl)agmatin) to prevent muscle degradation in patients with muscular dystrophy (Sugita et al. 1980). E64 was first isolated as a papain inhibitor from the culture medium of Aspergillus japonicus. Typical derivatives, E64c (N-(N-(L-3-trans-carboxyoxirane-2-carbonyl)-L-leucyl)isoamylamine) and E64d (N-(N-(L-3-trans-ethoxycarbonyloxyoxirane-2-carbonyl)-L-leucyl)isoamylamine), a membrane-permeable derivative of E64c, have together with E64 been widely used for various purposes (Ishiura et al. 1981; McGowan et al. 1989; Suzuki et al. 1981). Although E64, E64c, E64d, and leupeptin (N-acetyl-Leu-Leu-argininal) efficiently inhibit both μ- and m-calpains (see Fig. 3), they are not very specific as they also inhibit other cysteine proteinases. Leupeptin inhibits proteasome at the same or even lower concentrations. It is noteworthy that E-64 and leupeptin do not suppress the autolysis of p94 at all as described later (Sorimachi et al. 1993a). Calpain inhibitors I (N-acetyl-Leu-Leu-norleucinal) and II (N-acetyl-Leu-Leu-methioninal) are frequently used and commercially available (Wang 1990), but they also inhibit proteasome and other cysteine proteinases (Figueiredo-Pereira et al. 1994; Tsubuki et al. 1996). In this respect, the results concerning the differential inhibition of calpain and proteasome by di- and tri-leucyl aldehydes as shown by Tsubuki and colleagues are noteworthy (Tsubuki et al. 1996). They synthesized benzyloxycarbonyl-Leu-Leu-leucinal (ZLLLal) and benzyloxycarbonyl-Leu-leucinal (ZLLal) and showed that both ZLLLal and ZLLal strongly inhibit calpain (Ki= ca. 1 μM), but that only ZLLLal inhibits proteasome [Ki= ca. 1 μM and 0.1 μM for the ZLLL-4-methylcoumaryl-7-amide (ZLLL-MCA) and succinyl-LLVY-MCA-degrading activity of proteasome, respectively] while the Ki for ZLLal is above 100 μM for both activities. These synthetic inhibitors are potentially useful for identifying the functions of calpain and proteasome in cell biology. Powers and coworkers (Bartus et al. 1994) developed ketoamide inhibitor molecules, AK295 (benzyloxycarbonyl-Leu-aminobutyric acid-CONH(CH2)3-morpholine), AK275 (benzyloxycarbonyl-Leu-aminobutyric acid-CONH-CH2CH3), and CX275 (the active isomer of the diastereomeric mixture of AK275), which are more effective and more calpain-specific than the above inhibitors. The Ki value of AK295 is about 30 nM for μ- and m-calpain and about 1,000 times higher for cathepsin B. The same researchers also screened derivatives of peptidyl alpha-keto compounds to improve the specificity and Ki value, and found that benzyloxycarbonyl-Leu-aminobutyric acid-CONH-CH2-CHOH-C6H5 (Ki=15 nM for m-calpain) and benzyloxycarbonyl-Leu-norvalyl-CONH-CH2-2-pyridyl (Ki=19 nM for μ-calpain) are the best inhibitors among over 100 molecules tested (Li et al. 1996; Li et al. 1993). On the other hand, Wang and colleagues (Wang et al. 1996) developed a novel inhibitor with a distinct inhibitory mechanism compared to the other active site-directed inhibitors as described above. Their inhibitor, PD150606, shows a Ki value for μ- and m-calpains of about 0.3 μM, but greater than 100 μM for cathepsin B and papain, indicating its high specificity for calpains relative to other proteinases. It binds to the Ca2+-binding domain of calpain thus inhibiting calpastatin binding. Therefore, PD150606, when used in combination with other active site-directed inhibitors such as AK295, produces a very specific inhibition of calpain, a characteristic that is essential for in vivo studies of the physiological functions of calpain. Bartus, R.T., Hayward, N.J., Elliott, P.J., et al. (1994) Calpain inhibitor AK295 protects neurons from focal brain ischemia. Effects of postocclusion intra-arterial administration. Stroke 25, 2265-2270. Crawford, C., Brown, N.R. & Willis, A.C. (1993) Studies of the active site of m-calpain and the interaction with calpastatin. Biochem J 296 ( Pt 1), 135-142. Emori, Y., Kawasaki, H., Imajoh, S., Imahori, K. & Suzuki, K. (1987) Endogenous inhibitor for calcium-dependent cysteine protease contains four internal repeats that could be responsible for its multiple reactive sites. Proc Natl Acad Sci U S A 84, 3590-3594. Figueiredo-Pereira, M.E., Banik, N. & Wilk, S. (1994) Comparison of the effect of calpain inhibitors on two extralysosomal proteinases: the multicatalytic proteinase complex and m-calpain. J. Neurochem. 62, 1989-1994. Goll, D.E., Thompson, V.F., Taylor, R.G. & Zalewska, T. (1992) Is calpain activity regulated by membranes and autolysis or by calcium and calpastatin? Bioessays 14, 549-556. Gonen, H., Shkedy, D., Barnoy, S., Kosower, N.S. & Ciechanover, A. (1997) On the involvement of calpains in the degradation of the tumor suppressor protein p53. FEBS Lett. 406, 17-22. Grynspan, F., Griffin, W.B., Mohan, P.S., Shea, T.B. & Nixon, R.A. (1997) Calpains and calpastatin in SH-SY5Y neuroblastoma cells during retinoic acid-induced differentiation and neurite outgrowth: comparison with the human brain calpain system. J Neurosci Res 48, 181-191. Hata, S., Sorimachi, H., Nakagawa, K., Maeda, T., Abe, K. & Suzuki, K. (2001) Domain II of m-calpain is a Ca2+-dependent cysteine protease. FEBS Lett. 501, 111-114. Ishiura, S., Nonaka, I. & Sugita, H. (1981) Suppression of calcium-induced removal of the Z-line by a thiol-protease inhibitor, E-64-c. J. Biochem. 90, 283-285. Kampfl, A., Posmantur, R.M., Zhao, X., Schmutzhard, E., Clifton, G.L. & Hayes, R.L. (1997) Mechanisms of calpain proteolysis following traumatic brain injury: implications for pathology and therapy: implications for pathology and therapy: a review and update. J Neurotrauma 14, 121-134. Kawasaki, H., Emori, Y. & Suzuki, K. (1993) Calpastatin has two distinct sites for interaction with calpain--effect of calpastatin fragments on the binding of calpain to membranes. Arch Biochem Biophys 305, 467-472. Kawasaki, H. & Kawashima, S. (1996) Regulation of the calpain-calpastatin system by membranes (review). Mol Membr Biol 13, 217-224. Kubbutat, M.H. & Vousden, K.H. (1997) Proteolytic cleavage of human p53 by calpain: a potential regulator of protein stability. Mol. Cell. Biol. 17, 460-468. Kuwaki, T., Satoh, H., Ono, T., Shibayama, F., Yamashita, T. & Nishimura, T. (1989) Nilvadipine attenuates ischemic degradation of gerbil brain cytoskeletal proteins. Stroke 20, 78-83. Li, Z., Ortega-Vilain, A.C., Patil, G.S., et al. (1996) Novel peptidyl alpha-keto amide inhibitors of calpains and other cysteine proteases. J. Med. Chem. 39, 4089-4098. Li, Z., Patil, G.S., Golubski, Z.E., et al. (1993) Peptide alpha-keto ester, alpha-keto amide, and alpha-keto acid inhibitors of calpains and other cysteine proteases. J. Med. Chem. 36, 3472-3480. Ma, H., Yang, H.Q., Takano, E., Hatanaka, M. & Maki, M. (1994) Amino-terminal conserved region in proteinase inhibitor domain of calpastatin potentiates its calpain inhibitory activity by interacting with calmodulin-like domain of the proteinase. J Biol Chem 269, 24430-24436. Maki, M., Ma, H., Takano, E., et al. (1991) Calpastatins: biochemical and molecular biological studies. Biomed Biochim Acta 50, 509-516. McGowan, E.B., Becker, E. & Detwiler, T.C. (1989) Inhibition of calpain in intact platelets by the thiol protease inhibitor E-64d. Biochem. Biophys. Res. Commun. 158, 432-435. Melloni, E., Averna, M., Salamino, F., Sparatore, B., Minafra, R. & Pontremoli, S. (2000) Acyl-CoA-binding protein is a potent m-calpain activator. J Biol Chem 275, 82-86. Melloni, E., Michetti, M., Salamino, F. & Pontremoli, S. (1998) Molecular and functional properties of a calpain activator protein specific for mu-isoforms. J Biol Chem 273, 12827-12831. Menard, H.A. & el-Amine, M. (1996) The calpain-calpastatin system in rheumatoid arthritis. Immunol Today 17, 545-547. Nakagawa, K., Masumoto, H., Sorimachi, H. & Suzuki, K. (2001) Dissociation of m-calpain subunits occurs after autolysis of the N-terminus of the catalytic subunit, and is not required for activation. J. Biochem. 130, 605-611. Nishimura, T. & Goll, D.E. (1991) Binding of calpain fragments to calpastatin. J Biol Chem 266, 11842-11850. Nixon, R.A., Saito, K.I., Grynspan, F., et al. (1994) Calcium-activated neutral proteinase (calpain) system in aging and Alzheimer's disease. Ann N Y Acad Sci 747, 77-91. Ono, Y., Kakinuma, K., Torii, F., et al. (2004) Possible regulation of the conventional calpain system by skeletal muscle-specific calpain, p94/calpain 3. J. Biol. Chem. 279, 2761-2771. Pariat, M., Carillo, S., Molinari, M., et al. (1997) Proteolysis by calpains: a possible contribution to degradation of p53. Mol. Cell. Biol. 17, 2806-2815. Roberts-Lewis, J.M., Marcy, V.R., Zhao, Y., Vaught, J.L., Siman, R. & Lewis, M.E. (1993) Aurintricarboxylic acid protects hippocampal neurons from NMDA- and ischemia-induced toxicity in vivo. J. Neurochem. 61, 378-381. Saatman, K.E., Murai, H., Bartus, R.T., et al. (1996) Calpain inhibitor AK295 attenuates motor and cognitive deficits following experimental brain injury in the rat. Proc. Natl. Acad. Sci. U.S.A. 93, 3428-3433. Saido, T.C., Nagao, S., Shiramine, M., et al. (1994a) Distinct kinetics of subunit autolysis in mammalian m-calpain activation. FEBS Lett 346, 263-267. Saido, T.C., Shibata, M., Takenawa, T., Murofushi, H. & Suzuki, K. (1992) Positive regulation of mu-calpain action by polyphosphoinositides. J Biol Chem 267, 24585-24590. Saido, T.C., Sorimachi, H. & Suzuki, K. (1994b) Calpain: new perspectives in molecular diversity and physiological-pathological involvement. FASEB J. 8, 814-822. Sarin, A., Adams, D.H. & Henkart, P.A. (1993) Protease inhibitors selectively block T cell receptor-triggered programmed cell death in a murine T cell hybridoma and activated peripheral T cells. J. Exp. Med. 178, 1693-1700. Siman, R., Bozyczko-Coyne, D., Savage, M.J. & Roberts-Lewis, J.M. (1996) The calcium-activated protease calpain I and ischemia-induced neurodegeneration. Adv Neurol 71, 167-174; discussion 174-165. Sorimachi, H., Ishiura, S. & Suzuki, K. (1993a) A novel tissue-specific calpain species expressed predominantly in the stomach comprises two alternative splicing products with and without Ca2+-binding domain. J. Biol. Chem. 268, 19476-19482. Sorimachi, H., Kinbara, K., Kimura, S., et al. (1995) Muscle-specific calpain, p94, responsible for limb girdle muscular dystrophy type 2A, associates with connectin through IS2, a p94-specific sequence. J. Biol. Chem. 270, 31158-31162. Sorimachi, H., Toyama-Sorimachi, N., Saido, T.C., et al. (1993b) Muscle-specific calpain, p94, is degraded by autolysis immediately after translation, resulting in disappearance from muscle. J. Biol. Chem. 268, 10593-10605. Squier, M.K. & Cohen, J.J. (1997) Calpain, an upstream regulator of thymocyte apoptosis. J. Immunol. 158, 3690-3697. Sugita, H., Ishiura, S., Suzuki, K. & Imahori, K. (1980) Inhibition of epoxide derivatives on chicken calcium-activated neutral protease (CANP) in vitro and in vivo. J. Biochem. 87, 339-341. Suzuki, K., Tsuji, S. & Ishiura, S. (1981) Effect of Ca2+ on the inhibition of calcium-activated neutral protease by leupeptin, antipain and epoxysuccinate derivatives. FEBS Lett. 136, 119-122. Takano, E., Ma, H., Yang, H.Q., Maki, M. & Hatanaka, M. (1995) Preference of calcium-dependent interactions between calmodulin-like domains of calpain and calpastatin subdomains. FEBS Lett 362, 93-97. Tompa, P., Mucsi, Z., Orosz, G. & Friedrich, P. (2002) Calpastatin subdomains A and C are activators of calpain. J. Biol. Chem. 277, 9022-9026. Tsubuki, S., Saito, Y., Tomioka, M., Ito, H. & Kawashima, S. (1996) Differential inhibition of calpain and proteasome activities by peptidyl aldehydes of di-leucine and tri-leucine. J. Biochem. 119, 572-576. Uemori, T., Shimojo, T., Asada, K., et al. (1990) Characterization of a functional domain of human calpastatin. Biochem Biophys Res Commun 166, 1485-1493. Wang, K.K. (1990) Developing selective inhibitors of calpain. Trends Pharmacol. Sci. 11, 139-142. Wang, K.K., Nath, R., Posner, A., et al. (1996) An alpha-mercaptoacrylic acid derivative is a selective nonpeptide cell-permeable calpain inhibitor and is neuroprotective. Proc. Natl. Acad. Sci. U.S.A. 93, 6687-6692. Zhang, W., Lu, Q., Xie, Z.J. & Mellgren, R.L. (1997) Inhibition of the growth of WI-38 fibroblasts by benzyloxycarbonyl-Leu-Leu-Tyr diazomethyl ketone: evidence that cleavage of p53 by a calpain-like protease is necessary for G1 to S-phase transition. Oncogene 14, 255-263.